May 6th - June 12th, 2010. Public reception Thursday, May 6th, 6-8pm. Freight+Volume is pleased to announce the debut of a significant new talent, Trudy Benson. Working in the rich abstract vein of Hodgkin, Oehlen, and Murray, Benson conjures up a dazzling theatre of mark making and pure delight in paint. She is unafraid to explore new avenues of proof that painting never dies, it only becomes more emphatically alive in its varied and stubborn pleasures. 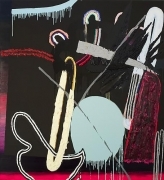 Benson provides a framework of superimposed and overlapping picture planes, thick sculptural relief, and brash color to convey this enjoyment. From subtle vignettes such as "Basketball" to bold tableaus such as "Space Jam 1" and "Painting", we share in the artist’s unbridled enthusiasm for the medium. 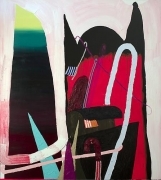 Inserting recognizable silhouettes into her paintings as she would a certain brush stroke, Benson suggests a belief that the contemporary abstract library must include shapes that garner some kind of outside (of painting) reference. None of the mark making is intended to be purely flat, rather it is all intended to have hermeneutic associations. Though one couldn’t look at one of these paintings and call it a picture, or imitation, in making the paintings solid paint is its own form and there is some kind of system, like plumbing, that speaks of the painting’s production. For example, the thickest of marks on the canvas is made with a loaded brush and its width extends slightly more on either side than that of the brush used to paint it. Every manifestation in paint is clearly imaged as a result of a particular application. Benson paints both tactilely and visually, attempting to bring these two different ways of experiencing the world into one painting. Painting cannot simply be ocular, there must also be a phenomenological approach to the painting as an object. The use of the expressionist brushstroke is best served next to a Jack Youngerman-esque cutout in paint. Benson's use of the gestural and painterly mark is not a stand-in for an emotional catharsis; it is part of a critical discourse with the history of painting. 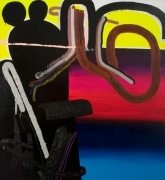 Her combining of different painting tropes is an articulation of what paint can do. Clement Greenberg spoke of painting’s inherent medium specificity by saying that a painting is a two-dimensional object, so ideally “pure” painting should be as flat as possible. 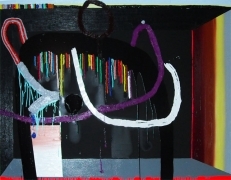 Benson argues that paint, as a heavy-bodied liquid, has an inherent viscosity. Heavy-bodied silhouettes or large solid forms suggest negative space, and at the same time the materiality of the form reiterates its presence. For Benson, making paintings has everything to do with the nature of paint at the surface as a sculptural material, color as a mutable component, and a contemporary painting vocabulary as inclusive of lowbrow culture as well as highbrow painting tropes. Trudy Benson completed her undergraduate work in Virginia, received her MFA this year from Pratt, and has already appeared in numerous group shows in NY and Boston. Please join us on Thursday, May 6th from 6-8pm to welcome and celebrate her first solo show in Chelsea. Texas-based artist Kent Dorn. In his haunting, thickly impastoed works, Dorn proves he is one of the chief narrators of American suburban angst and melancholy, doled out in equal measure with themes of apocalypse, religious (oc) cult and extra-ordinary phenomena. He is a rare portraitist of life on the fringes of society: runaways, gypsies, ex-cons, street survivors – icons of the dispossessed, deformed, lost, lonely and misunderstood. As well, Dorn focuses on details of this landscape: toadstools, skulls hidden in shrubbery, decomposed birds. Dorn does not merely present or regurgitate stories of this world – clearly he has lived them. These are highly personal and felt works; there is a spiritual and physical authenticity to these paintings which distinguish Dorn from his peers. Kent Dorn was born in small-town rural South Carolina, received his BFA from nearby Anderson College, and went on to gain his masters at the University of Houston. He has shown previously at galleries in Houston, Chicago and Toronto.